Ibanez SDGR Soundgear 5-String Electric Bass Guitar Indonesia. Condition is used. Item comes exactly as pictured. Gary Sinise autographed the bass, although there are no supporting documents. Thank you for your interest. The deep cutaway body allows for unencumbered access to the upper regions of the fingerboard, ensuring solid playability. The SRF6 5-piece neck couples with to create stability and strength in a thin design with increased sustain and superior tone. A rare Ibanez SGR model with EMG electronics. VNice MIJ Ibanez Candy Red/Silver SDGR SR885 5 String: Made in Japan: ser# F0018703. The neck is small and fast and this bass plays very nicely (as easy as most 4 strings). Ours has never been abused and shows only modest wear(dings and edge nics). Hey there! I've had this bass around since the early 2000s. It is a "second" but all I can find wrong was the small finish blem near the neck pocket. Attached is all the hardware on the body minus the neck screws. IBANEZ SDGR Soundgear SR-300DX 4-String Active Bass - 1997. Made in KOREA. SDGR Soundgear Series. 4-String Active Bass. Made in Korea. Very Nice and low Action. Truss Rod 100% Works. Neck is Straight. Frets in a Perfect shape. But Nothing Major. XXNice Early Silver Ibanez SDGR 800 Bass w Bag Made in Japan: ser# F0129118 (Japan). Ibanez Soundgear basses are one of the most popular series of basses in the world. This is one of the cleanest I have seen in years and clean enough to go in a collection. 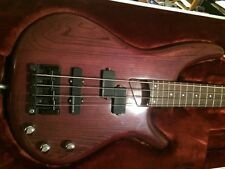 IBANEZ SDGR Soundgear SR-300 DX SA 4-String Active Bass - 2002. Sounds Great ! SDGR Soundgear Series. SR-300 DX SA. 4-String Active Bass. Sounds Really Amazing ! Neck is Straight. Frets in a Perfect shape. But Nothing Major. Extra Clean ! Very good condition, barely used the last ten years. The Ibanez Bass is an incredibly well-crafted and equipped bass for its price. It features a slim, fast SR4 5-piece jatoba and bubinga neck on a sculpted mahogany body. No case or anything else included, guitar only. Should you need more information on this item. we will make every effort to. ANY REASON. Up for grabs is a 2001 Ibanez SR405 in a very nice natural gloss finish, the bass is very nice and it has. From my personal collection and batch. Bass had the frets dressed and polished, fingerboard oiled, everything works as it should. 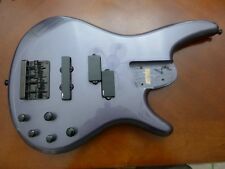 This is a slightly used Ibanez Soundgear SDGR 4 string bass guitar. 1990 Ibanez SDGR 1000E Electric Bass Guitar. This bass has been fully tested and cleaned! It sounds fantastic! The mother of pearl finish is stunning, very beautiful, very nice! Most notably along the bass, near the strap peg. This is a great looking guitar. I do have a set of D' Addario strings I can throw in depending on size you want to use. All of our sales are AS-IS. This is the Ibanez SR1825 5-String Electric Bass Guitar. Ibanez is celebrated for their thin necks and this SR has one of the best-. 73" at the 1st fret to. 80" at the 12 fret neck depth. This is your chance to get your hands on the Ibanez SR1825- an incredibly versatile bass with exceptional aesthetics. YOU ARE LOOKING AT A GREAT PIECE. Type of Bass Guitar NOT SPECIFIED. PARKER PAWN & JEWELRY. May have identifiable markings. There are many good quality products throughout Japan. Active PJ Bass Slim Neck. Neck: Maple (Slim Neck). Neck is fine. Frets: 80%. 2 Band EQ Active. Weight: 3.26kg. Sorry for your inconvenience if that is the case. Ready to play when you get. Asia, Middle East. Features · Remarks Soft case included. Body type Les Paul type. Even if you think to yourself, "But the item I want is only available in Japan.". Fret number 22 frets. We will look for and suggest the best products on your behalf. 90's IBANEZ / FujiGen SDGR SR500 JB. MIJ Slim Neck Active Bass. Neck: Maple. Neck Shape: Unknown. Neck is fine. Frets: 70%. Weight: 3.2kg. Ready to play when you get. Fret number 24 frets. Finger board material Ebony. Body Material Ash. Neck material Maple. Asia, Middle East. Even if you think to yourself, "But the item I want is only available in Japan.". More about the bass you can read on photo from Ibanez catalog 1996. More about the bass you can read in photos from Ibanez catalog 1995. IBANEZ SDGR SR-850 RW which is popular because of its light weight and outstanding performance. In the 90's made in Japan at that time Fujigen was producing, quality is one without a mistake. Equipped with an active 3 BAND equalizer, it has a wide variety of sound variations, a heavy bass sounded heavy bass sound. The handling is also a base that is really easy to play. Accessory gig bag. Asia, Middle East. Even if you think to yourself, "But the item I want is only available in Japan.". Number of frets 24. Fingerboard material Rosewood. Ibanez sdgr 5-string 6-string base, Serial number : F0044220. Item Title. It is the cost performance model of the SR series which enabled outstanding performance performance with slim neck IBANEZ SR 530 MADE IN JAPAN BLK. It is precious Japanese made in Japan at the Fujigen factory in the 1990s. It is one that is easy to play very easily even for beginners with outstanding performance and light weight with its own body shape. The sound is also thick, it supports various genres and play styles. 1989 Ibanez SR 1000 E (! SDGR Bass Japan Highest Model The first generation model. More about the bass you can read in photos from Ibanez catalog 1990. Body: Light Ash (Sen - japan's Ash). 26 years age guitar!). Color: RBR (Roof Beer). Nut width: about 38 mm. Truss rod : Unknown. Serial number: JAPAN F414xxx. This has small scratch marks or paint peeling and dent, but not obtrusive much, Nice condition. It is a popular high quality IBANEZ SDGR series SR800 PW Pearl White which was released in the late 1980s. It is a fine guitar that outputs clear and thick sound with the original low impedance pickup and 2 band active equalizer. Body material: Basswood Neck: Maple Fingerboard: Rosewood Pickup: Original REGURATED LD-Z Ibanez Pickup Weight: about 3. Color: JB (Jewel Blue). Nut width: about 38 mm. Truss rod : Unknown. The neck is straight. Play condition is excellent. Serial number: JAPAN F313xxx. Includings : Soft Case. I will try my best to resolve the issue. Pick up: IBANEZ P1 J1. Color: JB Jewel Blue. Nut width: about 39 mm. Truss rod : Unknown. The neck is straight. Play condition is excellent. Serial number: MADE IN JAPAN F405xxx. The frets show a little wear but they are at 80% life left currently. 1990 Ibanez SR 1000 SDGR Bass Japan Highest Model All Original ! The first generation model. More about the bass you can read in photos from Ibanez catalog 1990. In 1990 the guitar was White Pearl. (1989 Ibanez SR 1000 SDGR Bass Japan Highest Model The first generation model. More about the bass you can read in photos from Ibanez catalog 1990. 26 years age guitar!). The first years when SR models began to do. Pickup: IBANEZ Original REGURATED LD-Z Ibanez Pickup. Truss rod : Unknown. Serial number: MADE IN JAPAN F73830x. This has small scratch marks or paint peeling and dent, but not obtrusive much, Nice condition. Ibanez SDGR SOUNDGEAR BY IBANEZ SR800LE from japan (42. Our Products are 100% Authentic. ).